HACK OLDHAM set Oldham Gallery alight after hours last night when local children came along to fill the museum with coloured LED Throwies. Part of a UK wide festival Museums at Night aims to encourage visitors to museums, galleries and heritage by opening its doors after hours and organising special events. Anyone was invited to the free event and encouraged to create their own light sculpture, contributing to the explosion of light generated by 1000 LED lights in space of a few hours. 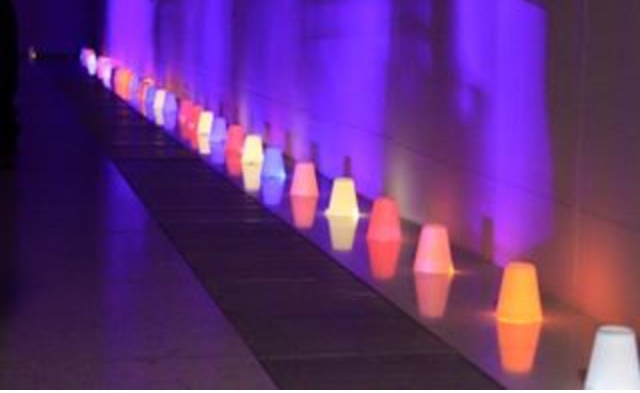 Museums at Night is a UK wide festival held in museums, galleries and heritage sites Special events are usually organised after hours and often held near International Museum Day celebrated on 18 May every year since 1977. LED Throwies are an inexpensive way to add colour. A Throwie consists of a lithium battery, a 10mm diffused LED and a rare-earth magnet taped together. Hack Oldham is a community of people with common interests, often in computers, machining, technology, science, digital art or electronic art, can meet, socialize and collaborate. Having met regularly over the last few years on Bank Top Tavern pub in Oldham Hack Oldham have recently acquired their own space on Hardcastle Street and currently developing a calendar of activities and events. Often a hackspace will have two areas, a co-working environment where people can work on software projects, websites, or just general computer work and a workshop where people work on more physical items whether that be crafts or prototyping of ideas. Hackspaces are designed for people who make things so could be used by almost any creative. A space to be with other people and to use equipment too. Originally set up in the States the idea is now taking off in the UK. Local Hackspaces can be found in Manchester and Liverpool. STEM Ambassador, Code Club Mentor Andy Powell is Director of CAFFEINATED PROJECTS, – (a local website and internet consultancy offering website design, web hosting and training) is the founder and key sponsor of Hack Oldham along with Andy Hughes, Business Partner at Caffeinated Projects.